This is part 2 in a 3 part series on transforming your relationship with stress using a simple technique I call Stress Surfing. You can find Part 1 here. Well, that’s what this video series is all about! Stress Surfing, is a way of using mindfulness to completely change how you relate to stress. In this second video of this series, I explain step 2 in detail, and show you how to mindfully observe the physical sensations, thoughts and other mental activity that arise for you during stressful situations. I also explain why this technique works so well. My goal for this video series is not only to help you learn to transform your relationship with stress, but also to help you reduce the collateral damage inflicted on those around you when you’re feeling stressed! If you’ve got a friend who you think could benefit from a little de-stressing, send them an email with the link to this post. Just highlight the red URL below it and copy it. Then paste it into your email. It’ll only take you a few seconds and it could really help them out. Welcome to part 2 of this three part series on how to use mindfulness to transform your relationship with stress. If you haven’t yet watched part 1, I recommend you do that first because it lays the foundation for what we’re going to do in this video. So, now that you’re intimately familiar with the physical sensations and mental activity that you associate with feeling stressed, you can move on to step 2 of the Stress Surfing technique, which is to apply mindful observation. So, what do I mean by mindful observation? Well, to be mindful of something means to be alert and clearly observe it in an accepting and non-reactive way. Let’s apply this definition to the physical sensations that you associate with stress. I’m starting with the physical sensations for a couple of reasons. First, they tend to be easier to notice for most people than things like thoughts or other mental activity, and second, they’re less seductive than things like thoughts. It’s easier to observe them without getting carried away by them and lost in their content. So, to be mindful of the physical sensations associated with stress, you need to first identify those sensations as being present, which you learned to do in part 1 of this series, and then you need to fully accept those sensations. Simply allow them to be present. Now, I know that these sensations can feel pretty uncomfortable, sometimes intensely so, so there’s a natural tendency to resist these sensations, or suppress them, or try to get rid of them in some way. That’s totally normal. But that’s exactly what I want you to practice not doing! Don’t give in to the urge to push those sensations away! Instead, open up to them. Allow them to be present. Be curious about them. And observe them carefully. Now, why on earth would you want to do something like this? After all, these sensations probably feel pretty uncomfortable. They’re what makes the stress so awful in the first place! The reason you want to do this, is that trying to get rid of the stressful sensations, thoughts and so on only makes the stress worse. It fuels it. Sure, you might succeed in temporarily escaping from these feelings by distracting yourself with something, or acting out on those uncomfortable sensations. But all that does is reinforce the wrong kind of habit, one of reacting to stress with avoidance, rather than being able to face it squarely and work with it. I think the ideal scenario for most of us is to be able to experience these stressful feelings and keep a cool head. Be able to clearly see our situation and then consciously act in the most appropriate way. In order to do that, you need to be able to tolerate these uncomfortable sensations to a certain degree. You need to allow them to be present and observe them non-reactively. This is what I call surfing the stress. This non-reactive observation is the hallmark of mindfulness, and it’s what gives mindfulness it’s incredible transformative power. It’s the active ingredient. So training yourself to do this is key for learning how to surf the stress in your life. If you find this difficult to do at first, don’t worry about it. Most people have trouble with this when they get started. Just keep practicing this kind of non-reactive, receptive, curious observation of the physical sensations. It will get easier – I promise! What you’re doing is counteracting the habitual tendency to resist or avoid these sensations and act on them in unskillful ways. You’re beginning to form a new habit of mindful observation of the stress you’re feeling. Instead of fuelling the stress and reacting to it in a knee-jerk manner, you’re treating the stress as useful information. Information that you can use to make conscious choices and take conscious actions. 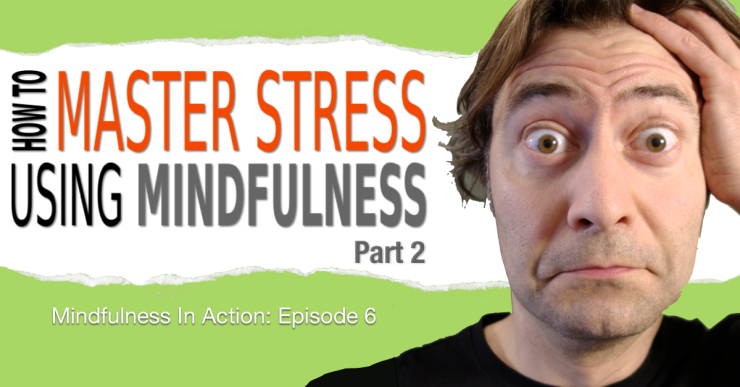 That wraps up part 2 of this series on Stress Surfing using mindfulness. In part 3, I’ll show you how to do the third step in this technique, which is becoming aware of how the sensations associated with stress arise and pass, all on their own. This is where your relationship with stress really starts to transform. So, go ahead and give the exercise in this video a go. Practice mindfully observing the physical sensations that are present when you’re feeling stressed! If you’re like most people, you’ll get plenty of opportunities throughout the day to try it out. Use them to the fullest! Also, if you’ve got a friend who you think could benefit from the Stress Surfing technique, send them an email with a link to this video and pass it along. I’m Nick Grabovac. Thanks so much for watching.